This example shows the importance of a treatment train, the percent imperious draining to the LID’s on a Subcatchment, the importance of optimizing for the number of units, area and soil thickness. Sustain will optimize the number of Rain Barrels on the ten Subcatchments. There is little removal as the Rain Barrels are not sending the overflow to the pervious area and there is little storage in a Rain Barrel. 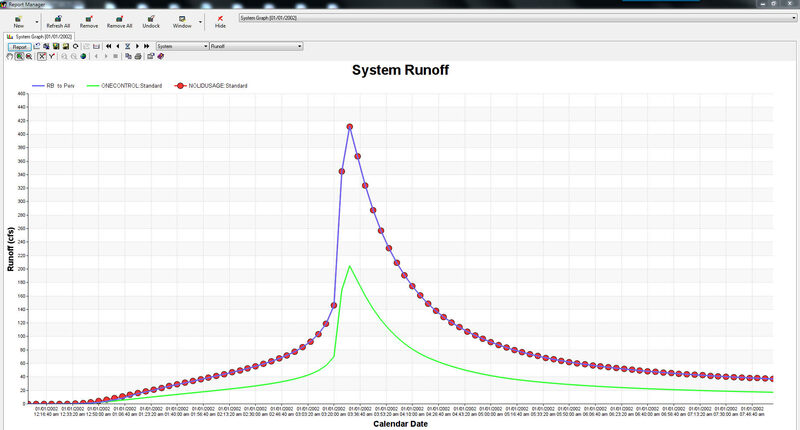 If you export the optimized LID’s to InfoSWMM (LID Usage DB Table) then you can see the effect of sending the flow to the pervious area from the Rain Barrels. The Red Dot Scenario is the Rain Barrels NOT flowing to pervious area but the outlet of the Subcatchment. The Green line is the Rain Barrel flowing to the pervious area. See also Tutorial 10.